If you don't know where you're from, then you don't know where you are, and you don't know where you're going. It's a fairly trite adage, but like most old sayings there's an element of truth to it. When it comes to visual media though, such sentiments seem to go out of the window, across the fields, and off into the wild blue yonder, especially where adaptations are concerned. So where does that leave Amagami SS? A number of people may already be familiar with the fact that the series is yet another adaptation of a dating sim, and given that this is the spiritual successor to Kimikiss, it's only natural that Enterbrain would attempt to emulate the relative success of the latter game and its anime adaptation. Unlike its predecessor though, Amagami SS decides to take a different approach with the storyline, and breaks things up into bite-sized relationship pieces that supposedly makes them easier to swallow, which works ... kind of. The series is split up into six short stories (and one "special" episode), that recount Tachibana Junichi's quest for high school love, and how he finds it with six different girls (and before you ask, no, this isn't School Days all over again). Along the way various relationship shenanigans ensue which cause the usual misunderstandings, reconciliations, attractions, repulsions, etc, etc. Now on the surface Amagami SS looks like the common or garden harem romantic comedy (but with the harem aspect applied in a different way). The plot follows the game's methodology by offering up multiple heroines for the protagonist to pursue, and while some may find this a refreshing approach, it's not really original as the series attempts to mask its shortcomings by adopting different narrative styles from one tale to the next. The biggest problem with short stories is that there needs to be enough content and context within the plot to justify the actions, thoughts and emotions of the characters, and it's surprising that Amagami manages to offer some semblance of a storyline over the course of each tale. Then again, the majority of development points where both the plot and the characters are concerned have really been done to death in anime and manga, so it's no surprise that there's at least a half decent story in there. After all, if you give enough monkeys enough time they can apparently produce Shakespeare (although it does make one wonder where they keep him). Each individual tale is pretty decent in its own right, but when one considers them as part of the whole a different picture begins to appear. What emerges are a series of contradictory actions and behaviours that don't really seem to make sense. Now these could be explained away by assuming that people act one way with one person, and another way with someone else, and so on, and one could easily view Amagami in this light. The problem is that this assumption ignores the portrayals of the characters in the previous stories, effectively making them little more than blank canvasses. To further compound this, certain characters seem to be clueless about the circumstances around people they've known for years. Still, if one simply treats them as a series of short stories then they can be entertaining, but the plot for each is nothing special, and the formulaic approach to each tale is, at times, a bit too familiar, and offers very little in the way of innovation, and rather a lot in the way of predictability. It's pretty obvious from the artwork that there is a large degree of genericism inherent in this anime, and Amagami does nothing to break away from the stereotypes. The high school setting, town and surrounding environs are nicely designed and detailed, but when it comes to rom-com anime, once you've seen one high school, you've pretty much seen them all. Granted there are a few exceptions to the rule, but in general there's not much difference between the various depictions on offer. The design principle is a little bit strange in one respect (which I'll come back to in a bit), as the characters are nicely envisioned, but are also as generic as they come (much like a lot of things in this anime). That doesn't mean they're poorly realised though, as they're clearly based on Enterbrain's designs from the games, and coupled with some decent animation and backgrounds, they do give the show a familiarity that can sometimes be mistaken for quality. The acid test occurs when one compares the series to its spiritual predecessor, and although Kimikiss was produced by a different animation studio, there are a number of similarities that stand out, not the least of which is the look of the heroines. But simply looking like another show doesn't mean that the design and animation is substandard, and in all honesty Amagami does manage to hold it's own in the visuals department. It simply could have been better than it is, and it's puzzling why this isn't the case, especially for such a popular gaming franchise. One of the better aspects of the series is the music, specifically the manner in which it's used rather than the actual tracks played throughout the anime (which are fairly routine affairs, but that's pretty much expected by this point). There are far too many shows out there that play music for no specific reason, so it's nice to watch a series that treats silence as golden for a change, and this is something that works in Amagami's favour as it allows the viewer to focus on the characters without having to suffer through tunes that sound a lot like the music played in just about every other high school rom-com/drama ever made. That said, the music in itself isn't bad per se. It's simply ... generic (there's that word again), and even with two opening themes and six ending themes (sung by the lead actress from each character arc), there's little on offer that really stands out. Granted there are some decent enough songs (the law of averages and all that), but in all honesty this is probably nothing more than "when you're given lemons, make lemonade", or in this case, when you're given a romantic comedy drama, make a cheesy love song. Which leaves only the acting, and in this respect Amagami is a bit of a mixed bag. Maeno Tomoaki plays the role of Junichi rather well (even though it's a bit like playing the role of a wet paper bag at times), and the strength of his portrayal gives much needed support to the lead actress roles. See, here's the problem. No matter how good the seiyuu are, there's a limited amount that can be achieved in four episodes. Granted the actors and actresses have cameos throughout the series, but it's nowhere near enough time for them to truly come to grips with their characters. In this respect Kimikiss is actually superior, as by the end of that anime the seiyuu had grown accustomed to their roles and were able to play their parts with a confidence that, with the obvious exception of Maeno (who plays the only continuous lead character), none of the seiyuu in Amagami can match. All of which leads to the characters themselves, and in a nutshell they're as generic (I seem to be using that word a lot these days), as they come, but once again that doesn't automatically mean that they're bad. Junichi could very well be a poster boy for harem lead males, and fits just about every stereotype going, especially the ones about nice guys and being a little slow on the uptake. That said, he's a pleasant enough character, and as the only lead in focus throughout the series there is some development to be had, but the nature of the story dictates that this tends to be repetitive. Unfortunately the female leads aren't as clearly defined, and the reason for this is the relatively small amount of screen time they get. While they also grow as characters, this is tempered with a necessary urgency that precludes any substantial development. The supporting characters also suffer from the "resetting" of their personalities as this leads to repetitive behaviours and actions that simply don't go anywhere, and add nothing more than inane by-plays to the main narrative. Amagami SS isn't a bad show though, and it does have its plus points. The relationship mechanics are handled in a reasonable manner, and the characters, especially the male lead, aren't as wishy-washy as some I could name. The problem is that instead of trying something original, director Hiraike Yoshimasa and AIC have opted to follow a "tried and tested" method that will yield results when it comes to DVD sales and merchandising, but only in the short term, and this makes one wonder why a hugely popular game franchise like Amagami has an adaptation that is only passing good. The series is enjoyable to a degree, but it's still nothing more than one amongst many romantic comedies in anime, especially where schools are concerned. Given the popularity and fervour surrounding the games one would expect AIC to expend more effort on making the anime adaptation better than it is, especially where things like plot and design are concerned. Granted there's only so much one can do in that respect, but the overuse of stereotypes means that the whole series plays out like nothing more than a glorified advert for the game(s). Like so many other game adaptations, the producers, director, animation studio, and just about everybody else in the making of this series have failed to realise the what fans really want. Instead of offering something that is an evolution of the franchise, we're treated to nothing more than a vapid retelling of the same old story. 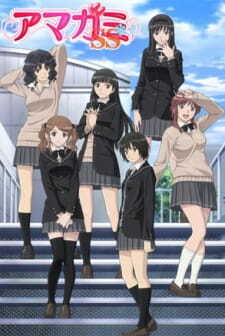 Even though the Amagami tries to be a little different with it's approach, one cannot laud the attempts to hide this anime's failings, especially the overtly generic design and plot, characters that don't really get the kind of attention needed to raise the level of the series, and an almost blind obedience to formula. In a very odd way, Amagami SS is a clear case of too many girls, not enough time, and the decision to make it in the first place seems to have had little to do with wanting to tell a story, and more to do with letting everyone know how good the games are. I suppose I can chalk this up as another "victory" for the marketing department. To put it simply, the combination of each of the heroines to the main protagonist is like a fireworks show. All of them are pretty. The story starts with our main male protagonist Junichi Tachibana being stood up on a Christmas Eve date which occurred two years ago. Having a hard time warming up to others, he does not have a girlfriend. In the seven arcs which comprises of four episodes each,(except for Risa Kamizaki who is given one episode) each arc is given one main heroine girl in which Junichi is their personal love interest. Each arc is set in a parallel universe, so the jumps from arc to arc do not follow up. Each arc is unique in itself. Not only are you given a different girl for each arc, but the circumstances and problems encountered are all different for each girl. This brings a little more flavor to the anime rather than being around the same issue. The only thing that affects the main story line that isn't changed in each arc is the fact that Junichi was stood up, so each arc starts from the same point as all the other arcs do with the characters being in the same relationship with Tachibana each time unless it is the heroine girl. The pacing of the story is about the same in each arc, but there would be times where you’d have little segments from the past being put in and the switches are noticeable so don’t worry with not being able to keep up. Each of the arcs endings are very satisfying. The art in Amagami SS was fluent and definitely consistent. The art style was about the same for each character, though their physical appearance may look quite different the outlines are still the same - it doesn’t become annoying though. The color shading was very neat and precise, the backgrounds astonishing. There were some sweet lake scenes where you could really appreciate the art. Color overall in the anime went very well with the atmosphere created by the main girl's emotion. There were times where the background would blur a little bit but you rarely take much notice of it. The art was not up to the particular par of Kyoto Animation (known for Clannad) but was very watchable for an anime aired in 2010. Overall the art was very fitting for the story in Amagami. The use of colour at different angles makes each scene enticing and memorable. Sound in Amagami SS was very crisp and clear. The OP, 'I Love' is an immensely addicting song for a romance anime. The EDs were sung well, and one thing to note is that each main heroine sings her own version of the closing song. The voice acting here was very smooth. Each of the main girls’ voice suited the type of appearance and personality they had. Another thing to note is that Amagami SS does not come in a dubbed form- for all those dubbed watchers out there-, from what I have searched. There might be a couple of fan dubs but it is doubted they’ll be any better than subbed. The characters were all unique. We are presented with Tsukasa, Haruka, Sae, Ai, Rihoko and Kaoru as the six main girls and Risa as the seventh. Each of the girls has their own unique traits, hobbies and personalities, of which all of them are very entertaining and likable (depending on what type of person you are). Tsukasa appears to be a kind class representative, Haruka the popular senior, Ai and Sae as Miya’s friends, and the two childhood friends Rihoko and Kaoru. Junichi, the main male is kind, thoughtful and slightly perverted, but this side of him always ends up to be used in a form of comedy which ended up being very repetitive- overused until it just wasn't funny. The supporting characters do not have much effect on the story line; in fact, they don't really do much at all. There is little-to-no development of them at all, but it does not get agitating, unless one of them was your favourite character. In the Kaoru arc, there was a narrator speaking what was going on in Junichi’s mind sometimes. This was only slightly bothersome though, but it’s assured some people just won’t like it. If you are new to romance or drama Amagami SS might be a good choice to be introduced to the genre, if not it might all seem a little cliché. But I don’t care; I’m a sucker for cliché. Amagami SS first started in the form of a game, which was the adapted into an anime. I’ve seen some manga of Amagami, and it goes into a little more detail than the anime- not that the anime hasn’t touched on the subject at all but that it shows what is occurring at an event much better. Re-watching this anime definitely added to my personal enjoyment of the series. The satisfaction in seeing your favourite pair come together in the arc is what makes me come back to it. The anime was very memorable, even a few days after I had finished but I have to admit that it’s very less in my mind now as with all the other awesome anime I have watched. Thanks for reading my review, or even parts of it- I don't blame you for reading all of it, but again, thanks you. No no, that's not what the story is all about. Sorry to scare you about a what you thought was a spoiler. Amagami SS hit every note correctly. As a fan of romance, it was a very, very, enjoyable series. Story: You have Tachibana Junichi. He has a calm and kind personality, and can be a pervert sometimes with his friend Masayoshi Umehara. As quoting above, he was stood up two years ago on Christmas Eve. That event derailed his happiness ever since. It affected him so much that he even made his closet into his bedroom. Present time, he now looks to overcome it. He starts to take interest in a popular senior at school named Haruka Morishima. She eventually makes Junichi her "pet" letting him carry her stuff. He then thinks it's a good opportunity to confess. He does, but all the hope he had in a relationship quickly shattered a couple seconds later. "I prefer someone who's reliable and older than me." (Haruka Morishima, Episode 1). Well, back to old ways now, right? Wrong. Junichi decides that he will keep trying. Well that's a preview of Amagami SS for you. I can write so much more, but I will try to keep it short and sweet for now. The story is set into multiple arcs, in omnibus format, meaning that these arcs do not happen in the same timeline, and happens in alternate universes. Also, as you can see from the above, the story is really entertaining. Some people will walk away from this anime saying it's cliche and all, but there's not that much cliche to begin with, or it could be that I was too busy enjoying this series. Character: Character development is a must for a good romance, and Amagami does it right. Different arcs mean multiple girls. Actually, you have 6 different ones to choose from. The popular and fan favorite Morishima Haruka, the childhood friend Tanamachi Kaoru, the shy and cute Nakata Sae, the other childhood friend Sakurai Rihoko, Miya (Junichi's sister)'s friend Nanasaki Ai, and Class-rep Ayatsuji Tsukasa. They all have different traits, which makes each arc very unique and entertaining to watch. I gave it a 9 for reasons withheld, if you finish the series, you'll probably agree with me. Art: The artwork is just crisp and clear, and the art makes the characters look very nice. No, I'm not talking about Morishima Haruka in her Santa costume, well, you can Google it and judge the art by the pictures, but in general, it looks really nice. I wouldn't say it's identical to Kimi ni Todoke, but it's similar in terms of it's clarity in the art. Sound: I have the OST, why? Because it's one of the OSTs that I enjoy listening to. The background music fits really well with what's happening in the anime, whether it'd be Junichi depressed in his closet again, or it could be the first time meeting someone. The OPs, I Love and Kimi no Mama de are one of the most catchiest songs I have heard in an anime. The EDs feature the main girl of the arc singing their own song. I can't recall if there were multiple insert songs, but there was one insert song that I couldn't stop listening to. Anyways, the sound and music were just beautifully organized for Amagami. It made everything natural and added the atmosphere to your viewing experience. Enjoyment: Amagami SS was a really enjoyable series to me, and probably one of my favorite romance anime out there. It combines well-done romance, with a generous portion of comedy. If this were a game (which it is), then the replay value would be very high, and it'd be a really good game as well. Before I go, some final words: If you're starting into the Romance genre, or a fan of Romance, or even just into comedy, give this series a chance. Amagami SS in short is probably the best adaption of a dating sim that stays true to its roots while feeling like it was from a collection of stories rather than a game. Each arc is wonderful to watch and fulfills the story for the viewer, in the end even actually expanding on it. Story: 10/10 It is in omnibus format meaning that the stories may contain the same characters but every four episodes they "reset" and focus on another aspect (in this case a girl) and expand the story on these "what if" moments. Overall very enjoyable each arc had it's differences and no two arcs were alike. The only similarity is the relationship building and character placing that occurred. That being said, each arc feels unique and enjoyable. Art: 8/10 Amagami SS isn't the greatest anime in terms of art I have seen, but in no means does it try to be that. The character movements are fluid and what you would expect from art style today, neither amazing or bad. Characters: 10/10 The 6 girls are all incredible in their own ways while the male lead isn't a terrible guy either, he is actually rather likable, indecisive occasionally but firm in what he thinks and should do most of the time. As for the girls they each have unique personalities and are all interesting in their own way. I will explain the girls below in the order that their arcs came. Kaoru Tanamachi: The tomboyish but feminine in a sense long time friend, very funny as well. Ai Nanasaki: An underclassman on the swim team, seems cold at first but warms up to MC, great personality not afraid to say what she thinks. Tsukasa Ayatsuji: Definitely the most interesting arc as well as character, being the Class Rep and a perfectionist with a few twists and turns along the way. This arc is a must watch, the character development in four episodes is amazing, I can't say enough. Enjoyment: 10/10 This will probably stay my favorite anime of all time I can't express enough of how much I enjoyed this series as a whole and how it stayed so true to form and how so much development of the characters could be done in four episodes while some take at least 3x that amount to get somewhere in romance. tl;dr Just watch it, all of it. Just once. For every anime series, there's usually at least one beach episode or pool episode included. And with these summertime episodes comes a big wave of fan service in the form of the anime swimsuit. From sensual to humorous, here are the top 20 anime bikini babes and swimsuit beach boys.